Visit Got Apparel online at GotApparel.com which is a wholesale apparel supplier, dedicated to providing brand name apparel at competitive prices. Got Apparel offers thousands of products and promote weekly specials for all members of the family. Visit 58Coupons.com for the best Got Apparel savings, Got Apparel coupons and Got Apparel free shipping offers from GotApparel.com. Save 10% on High Sierra Backpacks, Daypacks, Duffels and Luggage at Got Apparel with this promo code. Click link. Get free shipping from GotApparel.com when you shop for $150 or more. Some exclusions apply, click link for details. Hurry on over to GotApparel.com to save 10% on all shorts with this coupon code. Got Apparel is now offering a 5% discount on purchases of $100 or more with this coupon code. Click link to shop. 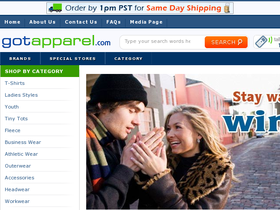 Get savings of up to 54% when you shop for brand name clothing at GotApparel.com. Click link to shop. Enjoy savings of up to 35% off at GotApparel.com's Closeout sale. Click link for selection. Buy more, save more with GotApparel.com. Right now you can save up to 17% with volume discounts. Click link now. Enjoy great deals on organic clothing for the whole family when you shop at GotApparel.com. Get individual items for less than $5.